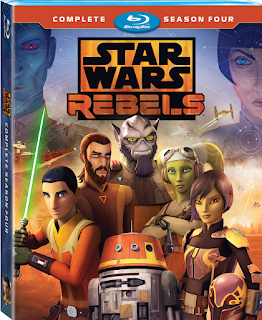 Star Wars Rebels: The Complete FourthSeason delivers all 15 action-packed episodes of the hit CG animated series’ final season, plus exclusive, never-before-seen bonus extras on Blu-ray™! This series is set between the events of Episode III and IV, Star Wars Rebels takes place in a time where the Empire is securing its grip on the galaxy and hunting down the last of the Jedi Knights. All while a rebellion against the Empire is starting to take shape! This is the series finale, so if you have loved and watched this series in the past, it would be a great edition to your collection. It’s been a long road for the Ghost Crew. Over the years they have made enemies, lost allies and told a great story. It is always hard to say goodbye to characters and a series that you love, but this series had great closure.